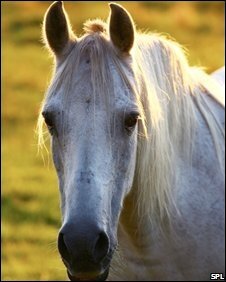 Horses have an almost human ability to conjure up visual memories of their herd-mates from the sound of their whinnies, a study has shown. Research by scientists at the University of Sussex revealed the animals were surprised when they heard the "wrong" whinny from a herd member. This "cross modal" recognition was once thought to be a purely human trait. 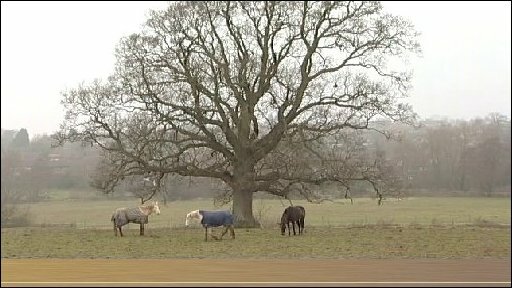 Twelve horses from Woodingdean livery yard, Brighton, and 12 from Sussex Horse Rescue, Uckfield, were studied. Horses make a whinnying sound when they become separated from their group. During the team's research, one of two familiar members of the herd was led past the horses and then behind a visual barrier. Once the animal was out of sight the horses were played a recording of a whinny that either matched the herd-mate they had just seen or the other animal. The scientists found that when the whinny sound did not match the herd-member seen walking behind the barrier the horses seemed startled. The findings, made by Dr Karen McComb and her team from University of Sussex in Brighton, were published in the journal Proceedings of the National Academy of Sciences. The team wrote in the journal: "Overall, horses responded quicker and looked for a longer time during trials in which the familiar call heard did not match the familiar horse previously seen, indicating that the incongruent combination violated their expectations. "This is the first clear empirical demonstration that in the normal process of identifying social companions of its own species, a non-human animal is capable of cross-modal individual recognition."